Fikile Mbalula. Photo: Wessel Oosthuizen/Gallo Images. The sports minister is in Spain to ‘aid’ local football development, but the DA believes he’s merely ducking his real responsibilities. Minister of Sport Fikile Mbalula is back in the headlines for the wrong reasons. In a statement on Friday, the ministry confirmed the controversial politician is currently in Spain after being invited by Javier Tebas, the president of the Spanish Soccer League (La Liga). “[Mbalula] was responding to an invite that sought to solidify relations between South Africa and the league,” it read. Yet “Minister Razzmatazz” apparently forgot he needed to be in South Africa last week to attend a parliamentary Q&A session. Instead, Mbalula has been taking selfies with Barcelona heavyweights Lionel Messi and Neymar. The DA didn’t take kindly to the minister’s jet-setting. “The minister should be accounting for his performance in parliament instead of taking selfies with Spanish football leaders like an enthusiastic groupie. For someone who loves the spotlight so much, it seems telling that Mbalula is dodging the opportunity to appear before parliament,” the party said in a statement. The ministry is adamant though that Mbalula’s visit will benefit local soccer development. 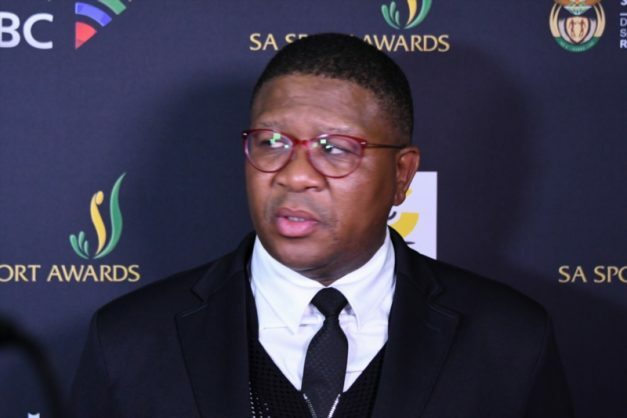 “Mbalula will sign a Memorandum of Understanding that will herald a new chapter between the department of sport and recreation [in] South Africa and La Liga in the development of football,” its statement read. Mbalula will also attend Saturday’s “El Clasico” clash between Barca and Real Madrid.